Folks seem to be coming around on the Pac-12. Times were, if you said it was possibly the best conference in college football, people would start looking for the cap to your whiskey bottle. Now, while some will concede the point and painfully agree, even the closet dissenters keep one eye open late on a Saturday night to see what the fuss is all about. The conference finished with six teams in the final Associated Press top 25, more than any other conference. Now that folks are coming around, it shouldn’t be so difficult to get some of their stars some Heisman run. And here are seven that might do it. As always, yes, I know this is basically a quarterback award, but just because the media and voters can’t see past the guys throwing the ball doesn’t mean we shouldn’t mention a few of the other guys. Smith is in the catbird seat now as the default, “USC receiver you can’t stop watching because he’s destined to be a star.” Smith is ground lightning in a football uniform. He has good hands, is immensely elusive, can outrun a PT Cruiser in a 40-yard-dash, and should have immense opportunity in a Trojan offense with plenty of options and plenty of 40-plus point games on the register. When Taylor Kelly went down last season, that was supposed to be pretty much curtains for Arizona State. In stepped mostly unknown Bercovici, who nearly tossed it for 500 yards in his first start and would eclipse that number later in the season. He has an absolute rocket for an arm and ASU figures to be a top 15 team at worst from start to finish unless bad things go down. Put a couple impressive wins on the pelt and maybe play for the conference title, and no question he’s in the chatter. Oregon is in an odd place. They lose their all-world Heisman Trophy quarterback but return the bulk of the starters that whizzed all the way to the title game. Over the past five seasons, the Ducks have rushed for the fourth most yards of any program. Freeman figures to continue that, and he runs like a bowling ball covered in tacks. Assuming (and it’s a fair assumption) the Ducks are in the mix for the conference crown, you’ll hear so much more of him than you have to this point. 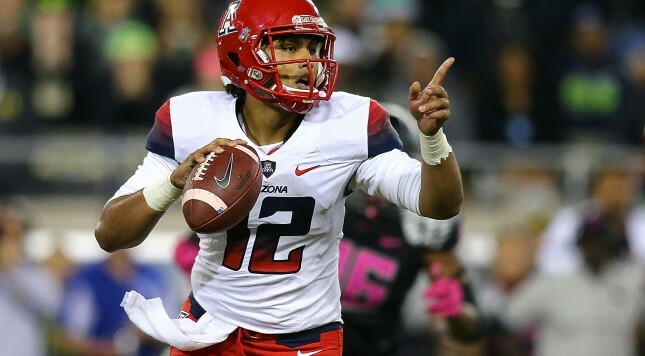 Jarrett Pekelo Kahanuolaokalani is his full name, so going Anu Solomon makes sense. Though I’d love seeing guys in the booth try and pronounce that every time he has one of his typical outstanding games. He was responsible for over 4,000 yards of offense and was immensely efficient for a freshman starting 14 games, 28 touchdowns to 9 interceptions. Arizona seems to not be getting the respect they deserve. Whatever USC ends up doing, Kessler is likely to be the guy who gets the majority of the offensive credit. Really, it’d be tough to name five quarterbacks on different teams (so no, you can’t take three from Ohio State) that you have more faith in than Kessler, a senior back for one last run at what he probably came to USC for … which is a title. Trojan players have fared well in the Heisman discussion over the years, and with some wins and losses style success, this one will too. Utah almost lost him to the evil NFL this past off season, but Booker is around for one more stint, possibly leaving as the most productive Utah back of all time. He was 20th in the nation in rushing yards last season with over 1,500 and has gained Heisman watch notice nationally, no small feat for a program that doesn’t get near the publicity of others in the conference. Though their styles aren’t completely similar, he reminds of Melvin Gordon of Wisconsin last year … capable of having such an explosive year, you demand taking notice. You think about all the great Pac-12 quarterbacks over the years, and you realize that Goff as a Junior is the only one to go over 450 yards passing five times. He already holds 19 school records and he’s only entering his third season in Berkeley. Last year he had seven 300-yard passing games, went 135 passes betwixt interceptions, and was top 10 in the nation in touchdowns, passing yards per game, points responsible for per game, completions per game, and passing yards total. Damn. Cal will need to etch a few more wins in, but he’s up to snuff and should be treated as such.